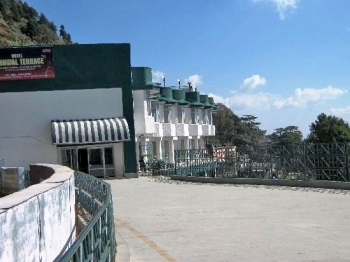 GMVN Hotel Garhwal Terrace TRH in Mussoorie is a deluxe rest house in Mussoorie. Mussoorie is one of the most frequent and popular hill stations of India. Garhwal Terrace Tourist Rest House at Mussoorie offers Deluxe rooms, Super Deluxe rooms and a Dormitory. The rooms are well equipped with modern amenities. GMVN Tourist Rest House also provides with day tours to places around. The TRH Mussoorie (Garhwal Terrace) is located in the middle of the Mall Road. Mussoorie is perched at an elevation of 2,005mts above sea level in Dehradun district of Uttarakhand state. The GMVN TRH in Mussoorie offers 08 Super Deluxe rooms and 10 Deluxe rooms to its guests. Each rooms provides all modern amenties and facilities such as attach bathroom, hot water, cable TV etc. The restaurant in GMVN Hotel Garhwal Terrace in Mussoorie serves mouthwatering veg and non veg cuisines.